I don’t really know anything about Vietnamese food, I imagine(d) it being some similar to Thai food, and heavy on fish sauce like Thai food. I also remember that Anthony Bourdain once ate porcupine in Vietnam. I was happy to have my preconceptions adjusted. 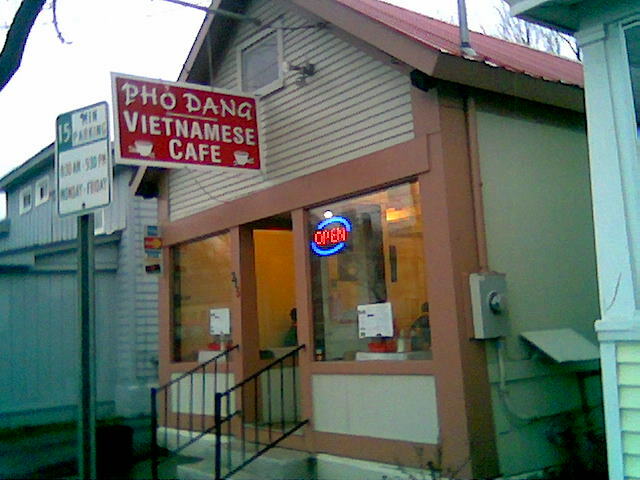 I’ve passed by Pho Dang Vietnamese Cafe in Winooksi Vermont a few times, and for lunch on Friday I decided to see what this popular place was all about. 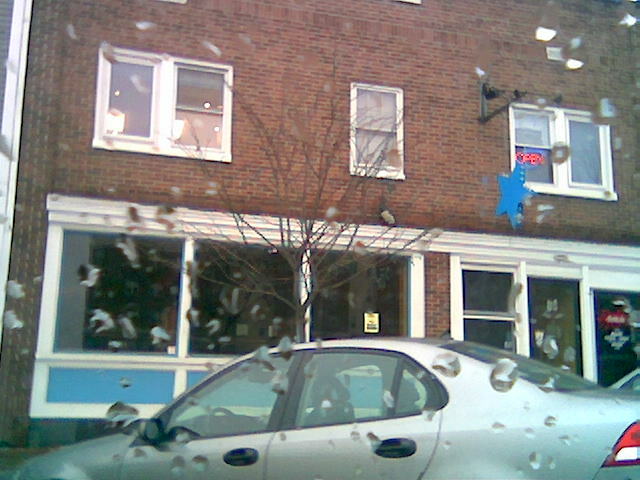 This small noodle cafe is the former site of Souza’s Burittos. Not knowing what to order, I ordered the “egg rolls” and the first “Pho” on the menu “Pho Ga”. 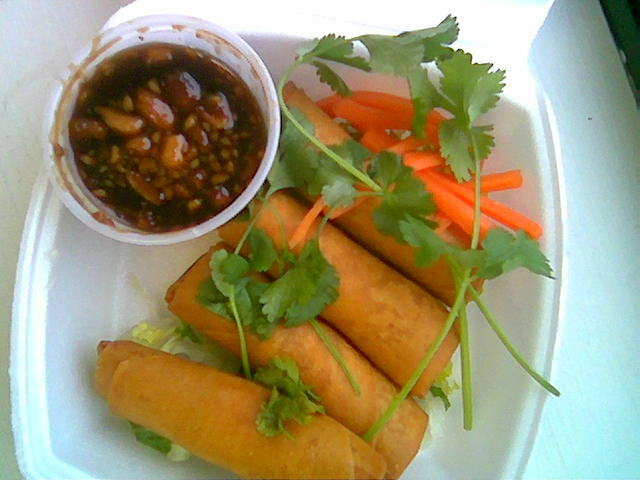 These egg rolls, appear to be more of a “spring roll”. I believe they are filled with seasoned ground pork (although not listed on the menu). The 4 rolls come garnished carrot juliennes and cilantro. The sauce is a yummy sweet, slightly spicy, tangy mix of flavors. Pho Ga is the boiled chicken noodle dish. I was confused at first when I opened my take out bag to see a small tub of noodles (not pictured), a quart tub of broth, and a bag of sprouts, limes, hot sauce, and some mint? First I dumped the noodles into the broth, and the formerly packed noodles seemed to cook a little in the hot broth. After being consumed with the delicious broth, and fun of eating noodles with chopsticks, I remembered the bag of accompaniments and to take a picture (above). I tossed in some sprouts into the soup, and a couple of the mint leaves, and swirled in a little of the hot sauce. The soup then takes on a new character, I made a discovery: Pho is fun to eat! I discovered that dipping the chicken into the hot sauce once it’s out of the broth is the way to go. 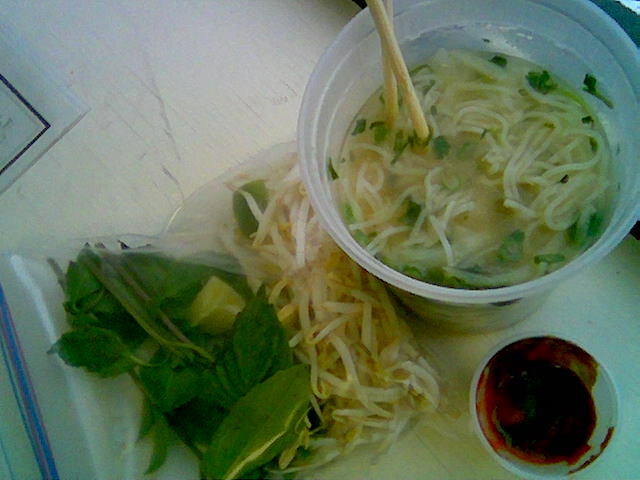 I will be back to get a little more acquainted with Vietnamese food, and get my noodle slurp on. The Pho was under $7 and the Egg Rolls were $3.50 (both came to under $10 with tax). 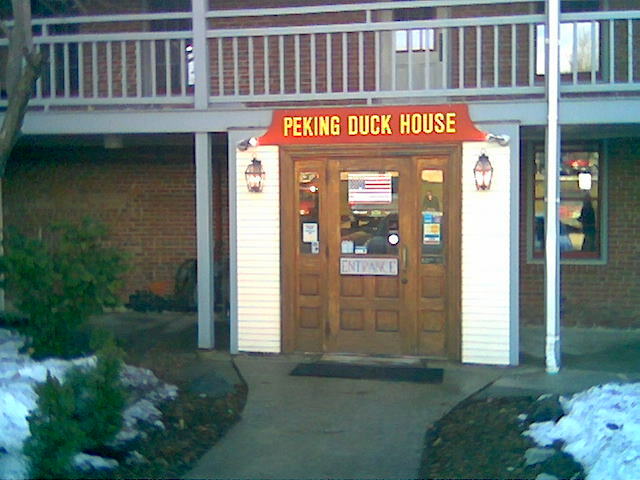 I decided to do Chinese again, so I went to the Peking Duck House in Winooski Vermont. The Peking Duck House, has a great interior, like many buildings in Winookski it may be a former mill. The table service is also good at the Peking Duck House, it’s nice “sit down” Chinese. 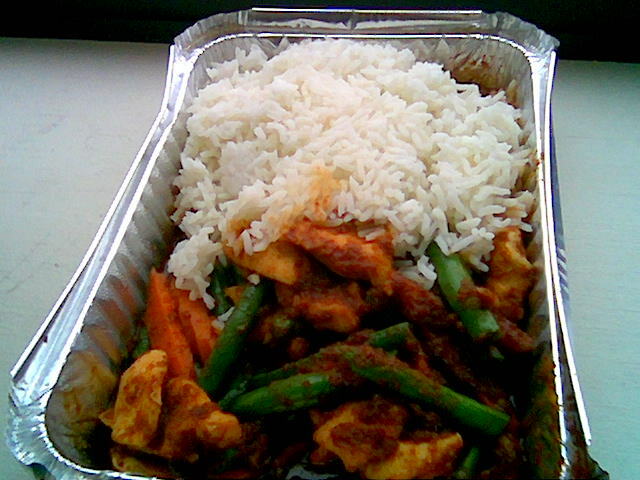 Hoping to do a little compare and contrast with China Express I ordered the “General Gao’s Chicken” (lunch special). Peking Duck House lunch specials come with a choice of soup, so I chose wanton for my cup of soup. 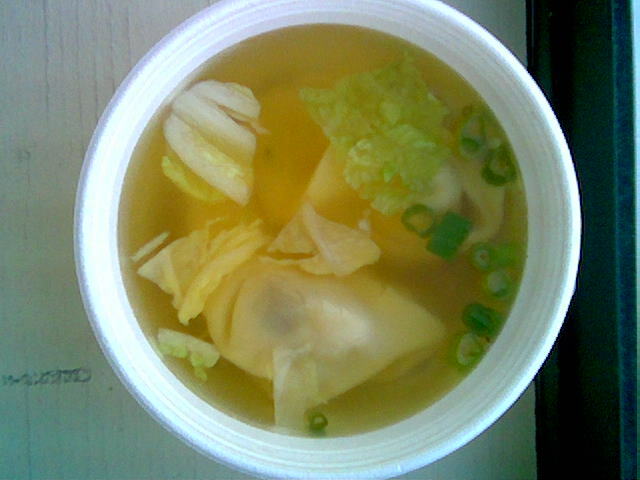 I like that the soup has both green onions and cabbage in it, also the broth is a little thicker and flavorful. I wanton are a little better than China Express, the noodle texture is good, and the wanton filling is tasty. 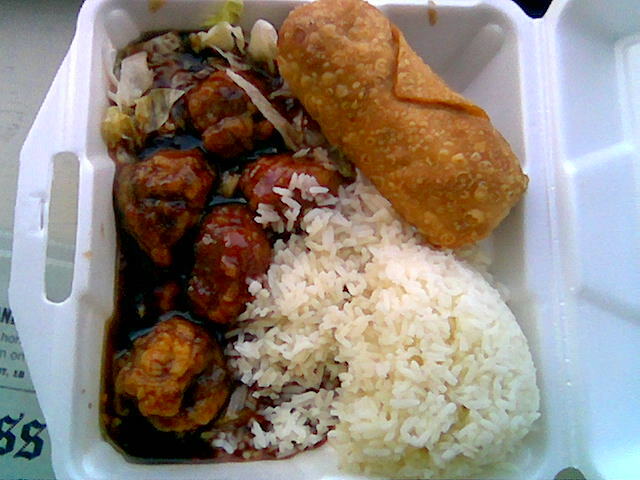 As pictured, this lunch plate comes with an egg roll and the obligatory rice. The egg roll was good, the wrapping was a little looser than your standard egg roll, I wonder if these egg rolls are made in house? The egg roll, has the classic pork, cabbage and 5 spice mix and was very fresh. The I ordered the General Gao’s “spicy” as Chinese food in this area tends to be very bland. The General Gao was a little spicy, and the sauce is terrific: not overly sweet, nice depth of flavor and the previously mentioned kick of heat. The chicken itself was a little underwhelming, the General’s Chicken wasn’t crisp despite being fresh. I would definitely recommend going to Peking Duck House, but I would try something else other than the General Gao’s if you like it crispy. 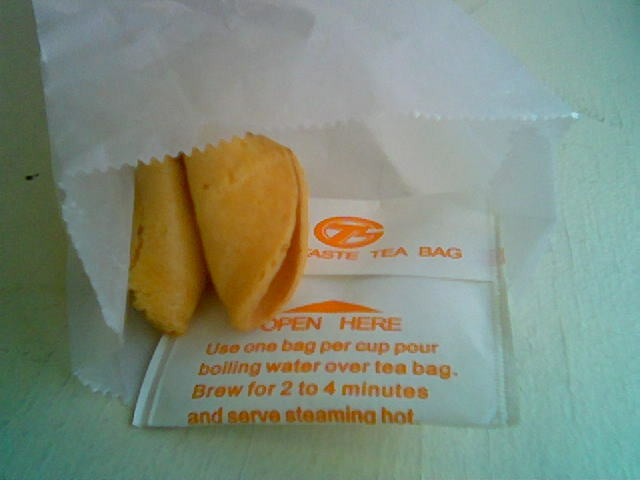 Peking Duck House does get points for including a tea bag inside the fortune cookie bag, I like having tea with my Chinese so this was a nice touch. This all inclusive lunch special was a very reasonable $7.90 with tax. 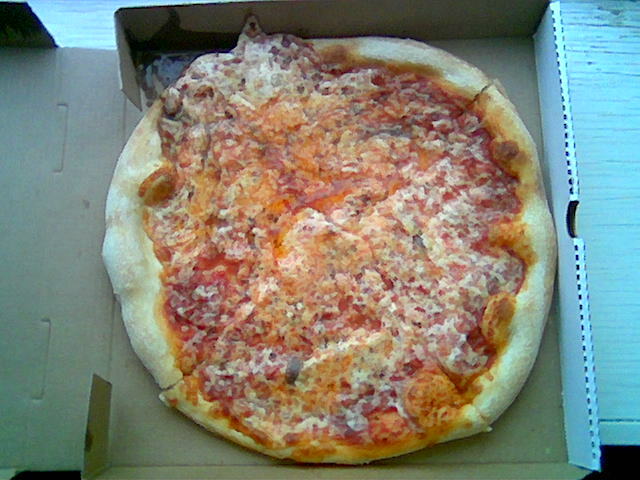 Donny’s New York Pizza is the first stop into Winooski Vermont over the bridge from Burlington. Last week there was pizza ordered for our office. (Disclaimer: as noted in my “About” section I shoot pictures with my cell phone, I find the best luck with natural light, this pizza pictures have washed-out color due to the office lighting). 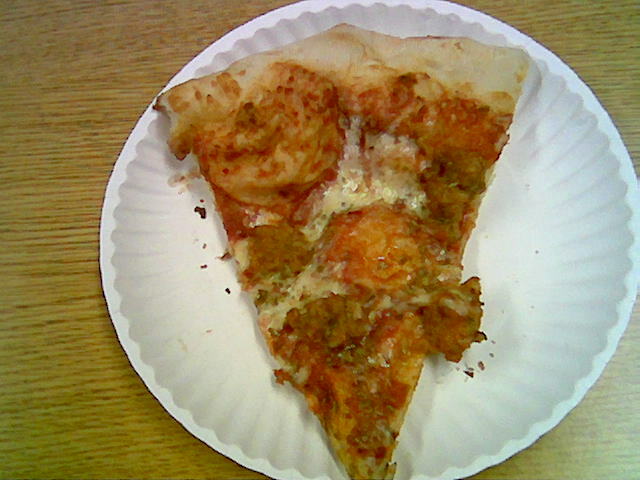 Donny’s pizza passes the chewy and crispy litmus test, and the sauce has a nice sweet rich tomato flavor. The sausage has a little kick of heat and great texture. 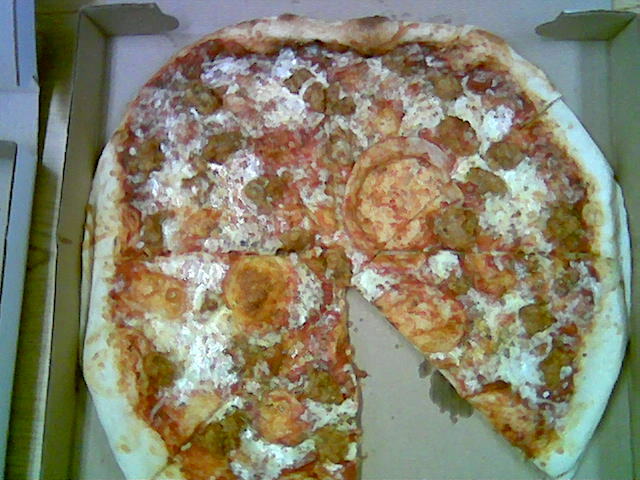 The sausage appears to be “loose”, versus sausage from a casing, the resulting texture is a nice contrast against the mozzarella. I usually stay away from sausage on pizza, but Donny’s selected the perfect sausage. 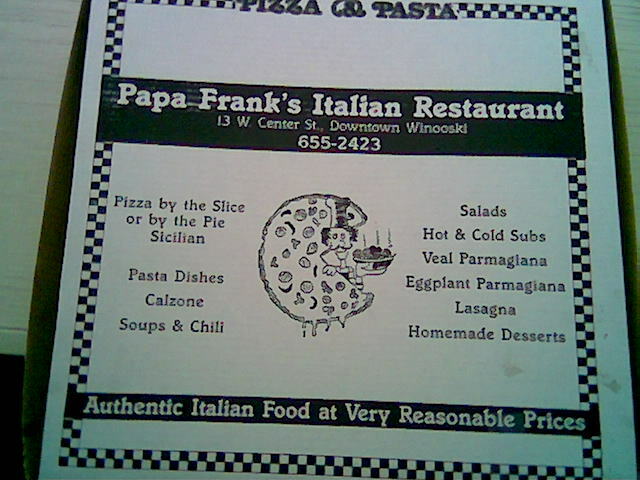 Also of note in this Greek-owned Pizzeria is the Sicilian pizza (yummy), I’ll have to report on that during a future lunch. Donny’s is a little less expensive than Junior’s. 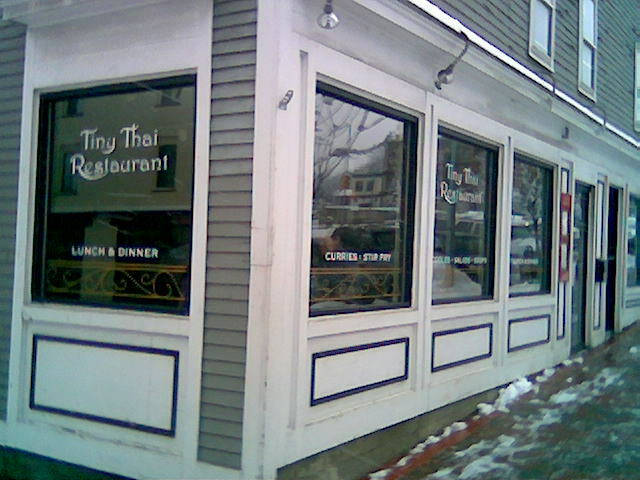 Tiny Thai has expanded from its Essex Vermont location, to a new Winooski Vermont location (down the street from Sneakers). It had been a while since I had Thai food, so I decided to “Thai one on” for lunch. Chicken Satay, side of peanut sauce. This is the best satay I’ve ever had. 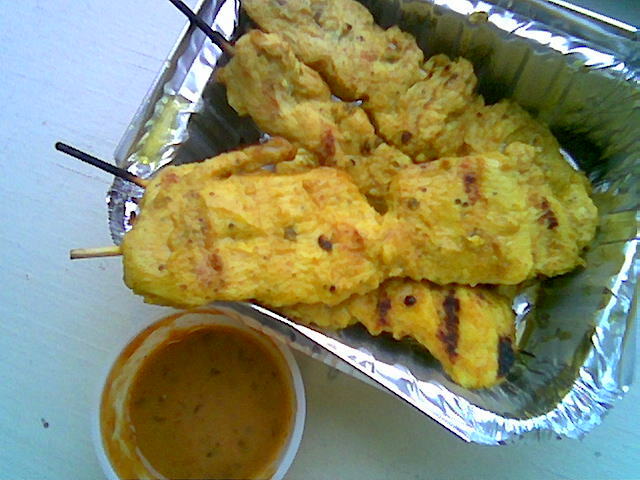 The chicken skewers (4) are marinated in coconut milk and spices (curry? ), then grilled, it’s served with a slightly spicy peanut sauce, which has chunks of peanuts and more coconut milk. Other satay I’ve had doesn’t have any coconut milk in it, the chicken in this version is wonderfully moist and flavorful. I would almost consider ordering a double order of these and having that for lunch. Pad Prik Khing apparently translates into stir-fried chili ginger. The carrots and green beans are nice and crisp, the Prik Khing curry paste has a nice texture, and nice heat. I think I may have become sensitized to fish sauce, as this dish was a little too “fishy” for me and I’ve enjoyed Pad Prik Khing in the past. It’s served with a nice portion of Jasmine rice. The satay was $4.50 and the Pad Prik Khing was $5.95 before tax. 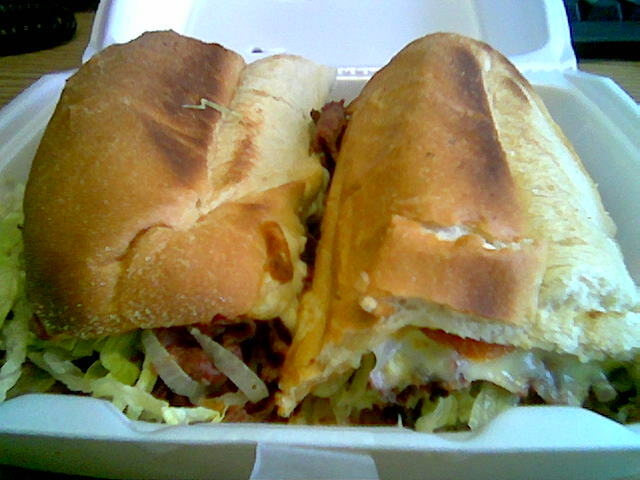 I recently discovered that I like pastrami, specifically lean pastrami. 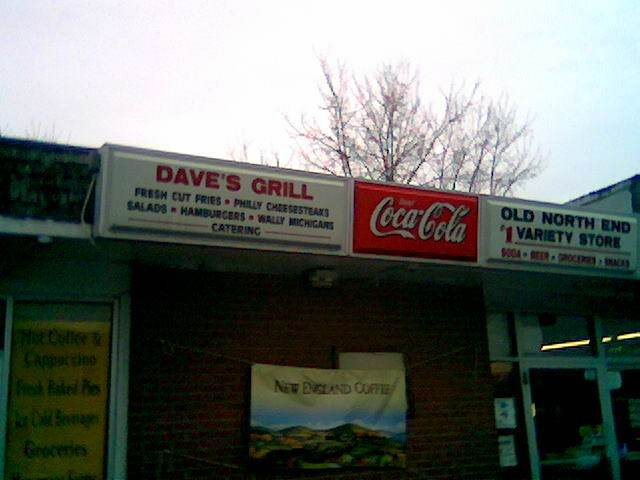 Subway has a pastrami sandwich, and I heard that the Oasis Diner in Burlington Vermont is going to be converted into a Jewish deli, so I’m looking forward to getting an authentic pastrami on rye. 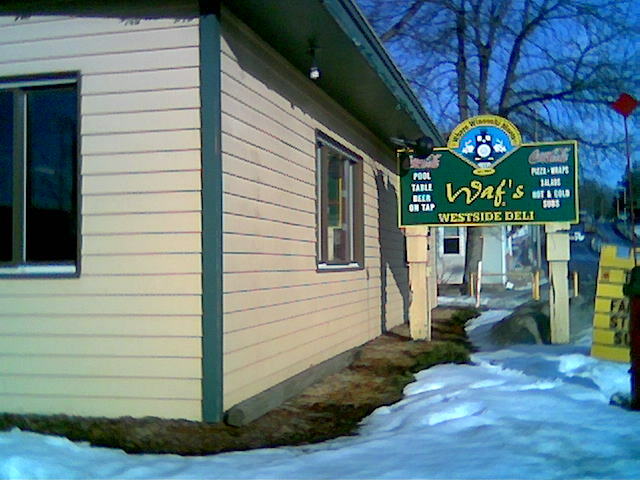 Waf’s Westside Deli also does a pastrami sub. 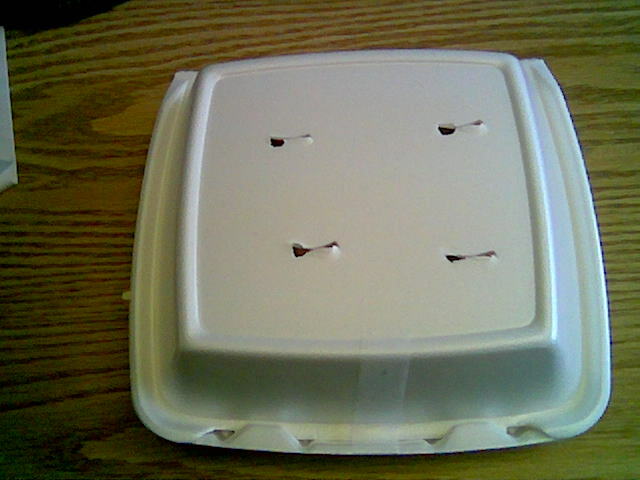 Why do I have a picture of a Styrofoam box? I believe Waf and crew put the four “custom” knife holes in the box, this serves to let some steam out, but keep the oven-heated sandwich crisp and hot. 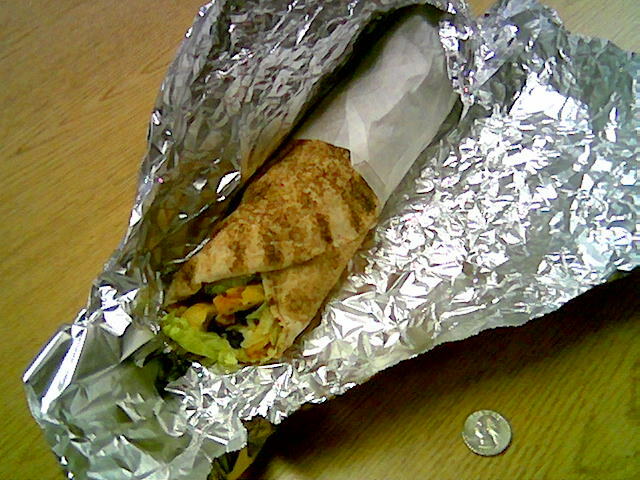 Nice attention to detail of how the sandwich will hold up as take-out. The pastrami is lean, the roll is crisp, and the lettuce also provides a nice crunch. The combination of mustard and the spiced meat, kind of reminds me of a hot-dog. I think next time I may take Subway’s cue and order this sandwich with pickles. As I mentioned in an earlier post, be sure to order in advance. The large sub is $7.66 before tax. 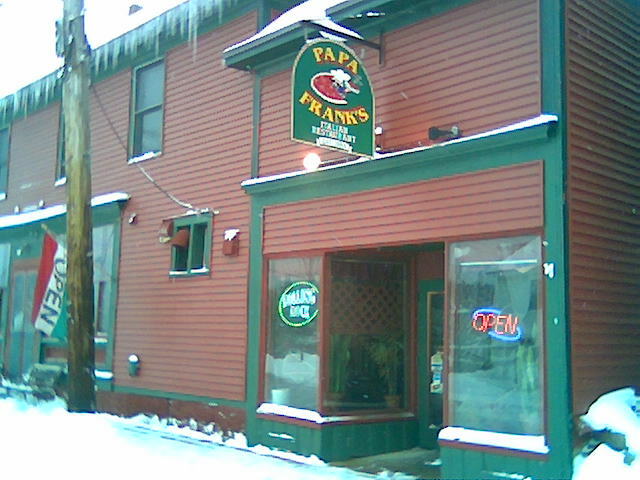 Sneakers in downtown Winooksi Vermont is known for their great breakfast. I personally love their specials known as “Jump Starts” in their basketball-themed menu. 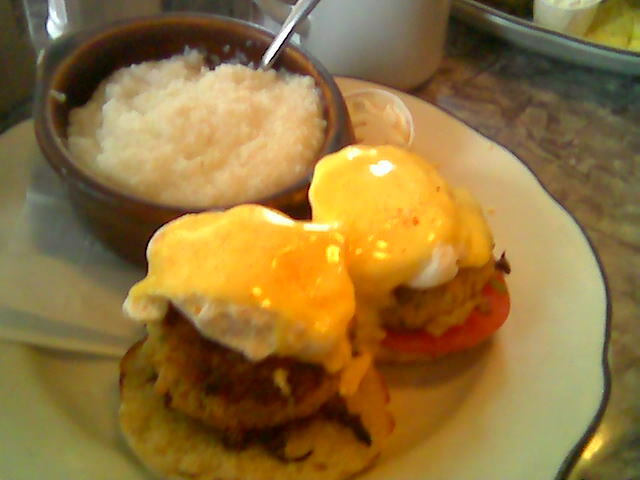 This last Sunday, I didn’t see any specials that I would care for so I ordered the Crab Cake Benedict off the menu. Hollandaise sauce, poached egg, crab and shrimp cake, fresh spinach, fresh tomato, english muffin (x2) with a side of grits. This is a dish where it’s clear that all of the items are meant to be eaten together. The hollandaise and egg yolk from the poached eggs permeated everything, and nothing is too firm, so it very easy to get a nice forkful of all the ingredients. The crab and shrimp cakes are nicely browned and meat / breading ratio is good (mostly meat). Suprisingly this dish isn’t a rich as it may look, I wish the picture was a little more infocus. 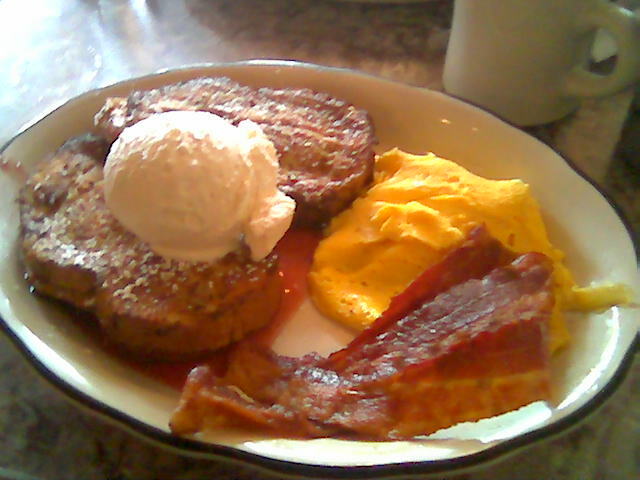 Grits; sneakers introduced me to grits, and I’ve become a convert, ordering grits instead of the good home fries. Grits are a corn based hot cereal, it took me a long time to figure out what my favorite topping for grits are. Cheese isn’t bad, but I perfer mine with rasberry jam, the texture is very similar. A note of caution on grits, they hold heat very well in this bowl it’s very easy to burn your mouth unless you’re careful, or eat them after you main dish like I did. But cold grits are no good as the nice “gritty” texture turns to rubber when cool. Oddly one of the poached eggs was hardboiled, I’ve ordered this a few times and this is the first time, there’s been anything to quibble over. This dish is $10.50 before tax.